It’s been a great 5 years for In Roosevelt History, but it is time for a fresh new look and feel. 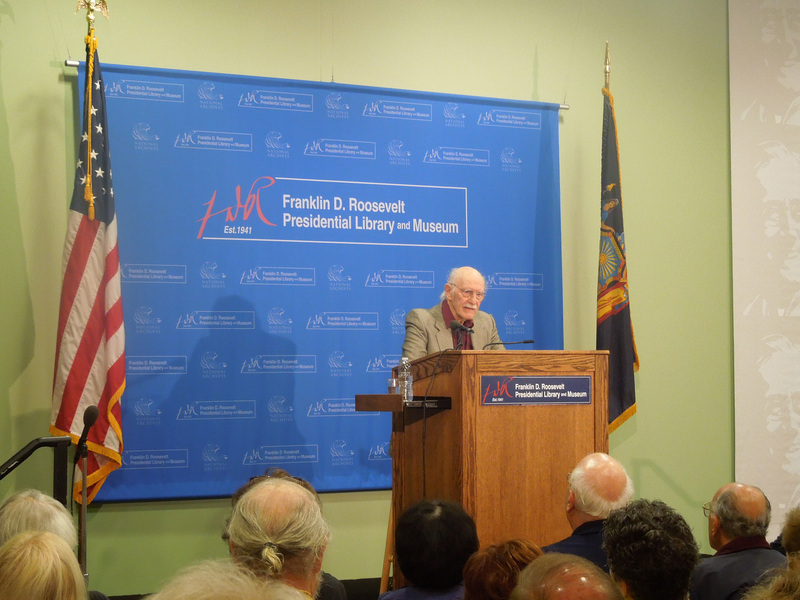 Besides an update, we are also moving our new blog to http://fdr.blogs.archives.gov/. 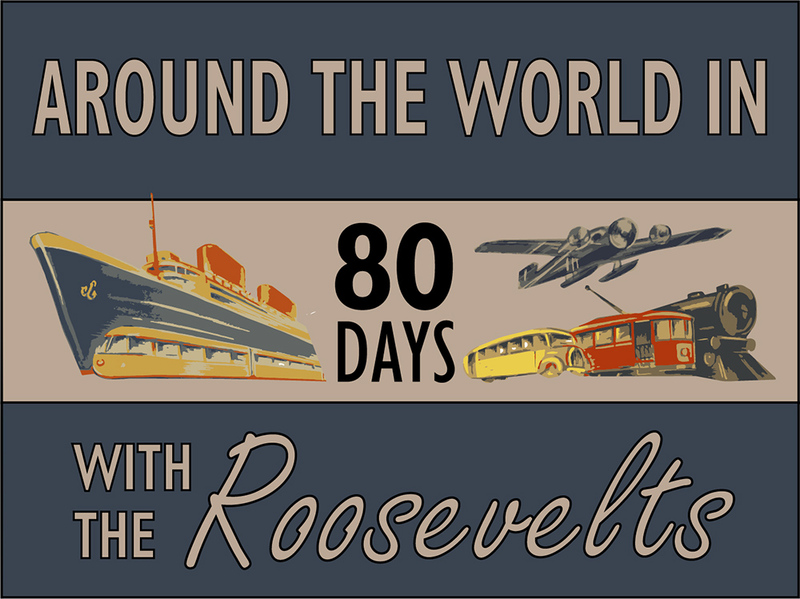 So, be on the look out for new content starting Sunday, April 12th on our new blog Forward With Roosevelt. See you all there! Of Persico’s writing career, Eric Sevaried described his Edward R. Murrow: An American Original as “the definitive” biography of the broadcast pioneer. The New York Times said of Persico’s The Imperial Rockefeller, “No one has written a book like this about Nelson Rockefeller before.” His Nuremberg: Infamy on Trial was described by the broadcast journalist, Howard K. Smith, as “Simply the best account of the trial.” This book was adapted by Turner Network Television as a miniseries that won two Emmy awards. Persico was the collaborator on former Secretary of State Colin Powell’s autobiography, My American Journey which remained twenty weeks on the New York Times best seller list. His Roosevelt’s Secret War: FDR and World War II Espionage also reached the best seller list and was chosen as one of the notable books of the year. His, Eleventh Month, Eleventh Day, Eleventh Hour, on Armistice Day, World War I, has been described by historian, Richard Norton Smith as, “The single finest work I have read on the Great War.” The Washington Post’s Book World said of his Franklin and Lucy: President Roosevelt, Mrs. Rutherfurd, “Persico… understands that Lucy Mercer helped FDR awaken his capacity for love and compassion, and thus helped him become the man to whom the nation will be eternally in debt.” “Roosevelt’s Centurions,” a detailed history of his World War II commanders — a 650-page volume published last year, was his final published book and his most ambitious. 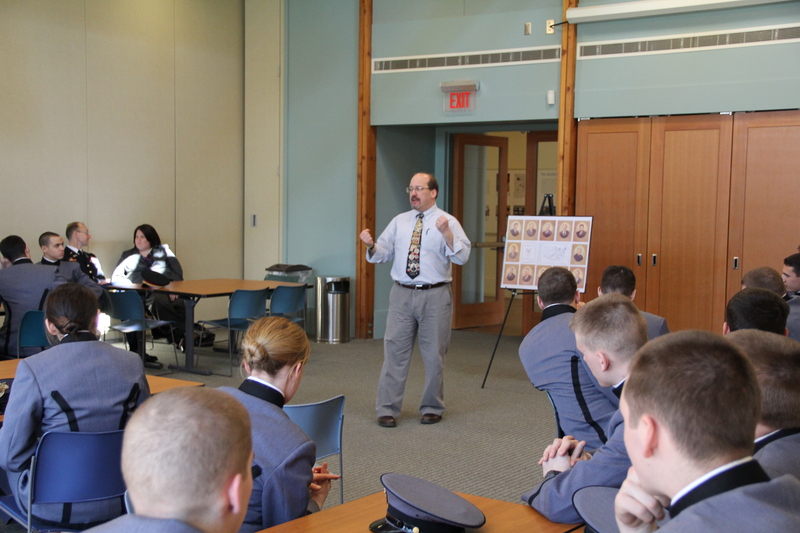 His articles have been published in American Heritage Magazine and the Military History Quarterly. He was a frequent reviewer for the New York Times Book Review and the Washington Post Book World and was a commentator on several PBS and History Channel documentaries. Joe Persico was a wonderful scholar and a true gentleman. 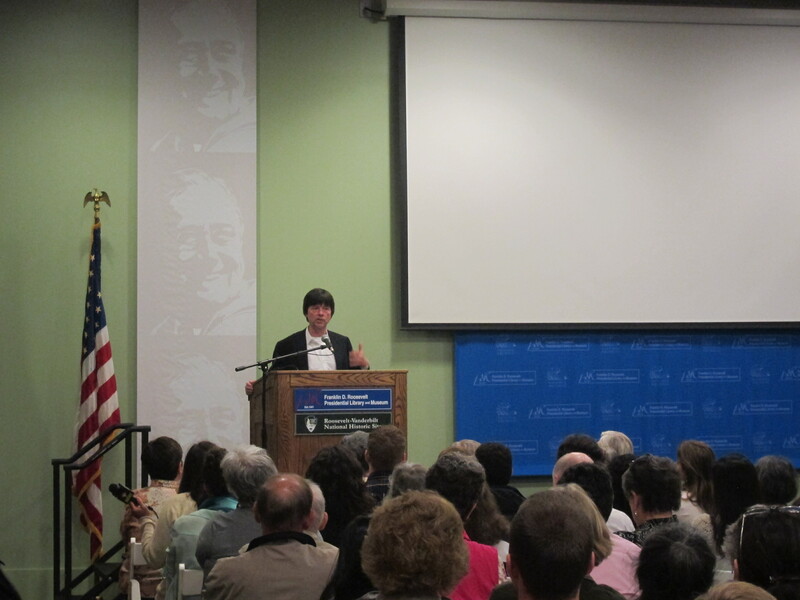 He was generous with his time and his expertise, appearing at five of our annual Roosevelt Reading Festivals. 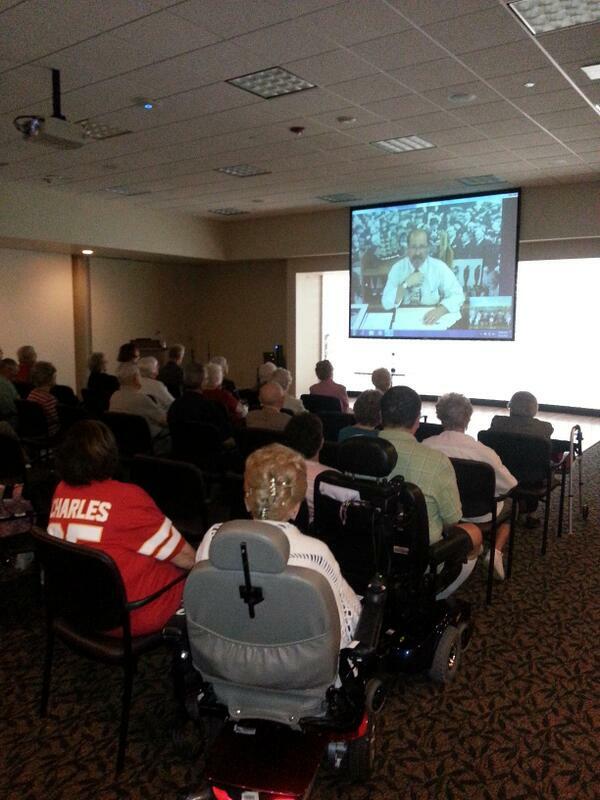 His program here at the Library in December 2001 on the 60th anniversary of Pearl Harbor–coming just weeks after the 9/11 attacks–was one of the most memorable and meaningful events in the Library’s long history. He will be greatly missed by his friends in Hyde Park. 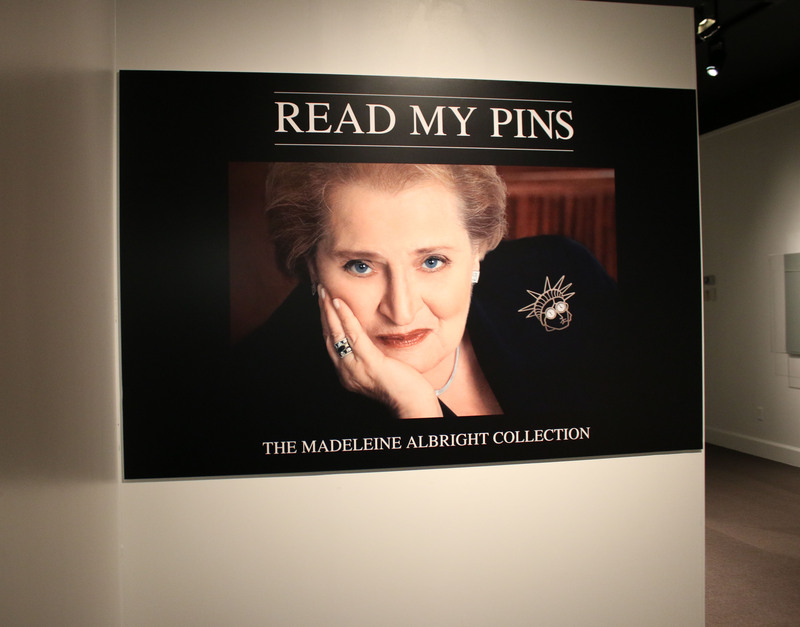 Starting on August 9th, Museum visitors will be able to experience a new traveling exhibition Read My Pins: The Madeleine Albright Collection in the William J. vanden Heuvel Special Exhibitions Gallery. This unique exhibit features a collection of more than 200 distinctive pins and explores how Secretary of State Madeleine Albright—the first woman to serve in that office—used jewelry as a diplomatic tool. Organized by the Museum of Art and Design in New York City, the exhibit has been touring the nation for several years. There is no additional charge to see the exhibit at the Roosevelt Library. 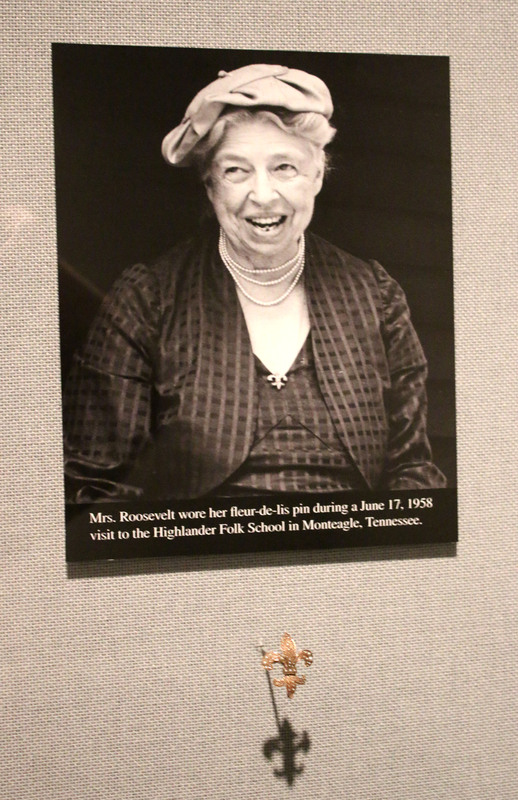 A display of Eleanor Roosevelt pins will complement the exhibition during its time in Hyde Park. Read My Pins will remain on display through November 2, 2014. Secretary Albright will make a special public appearance at the Roosevelt Library on the evening of September 4 in connection with the exhibition. 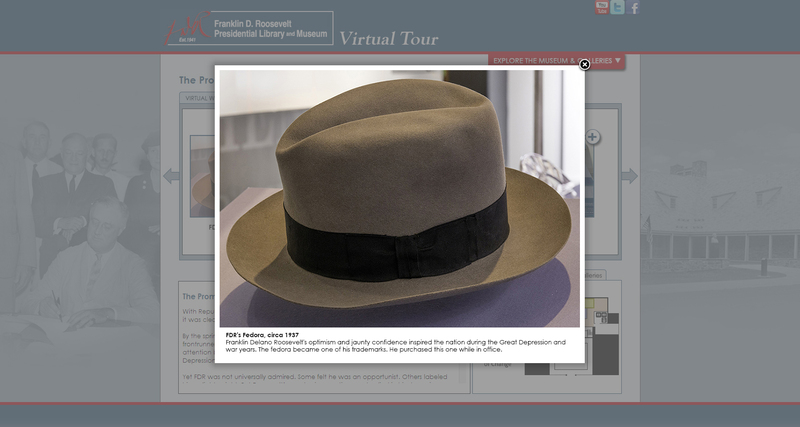 The Roosevelt Library’s new 12,000 square foot $6 million permanent exhibition, which opened to the public in June 2013, features a variety of audiovisual experiences, including an array of interactive touchscreen programs. 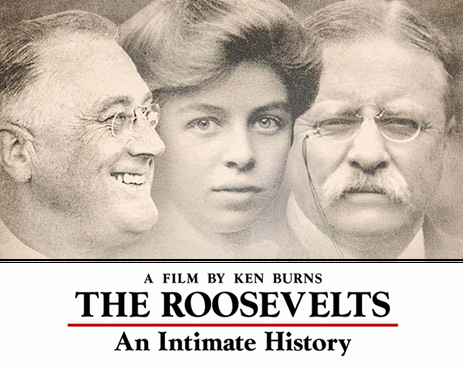 They help us tell the vital story of the Roosevelt era to new generations of Americans in fresh and engaging ways. These exhibits are just one part of a wider ongoing effort at the Library to harness new media technologies to reach new audiences. Later this year, the Museum will unveil two new media initiatives that will greatly expand accessibility to our exhibits. 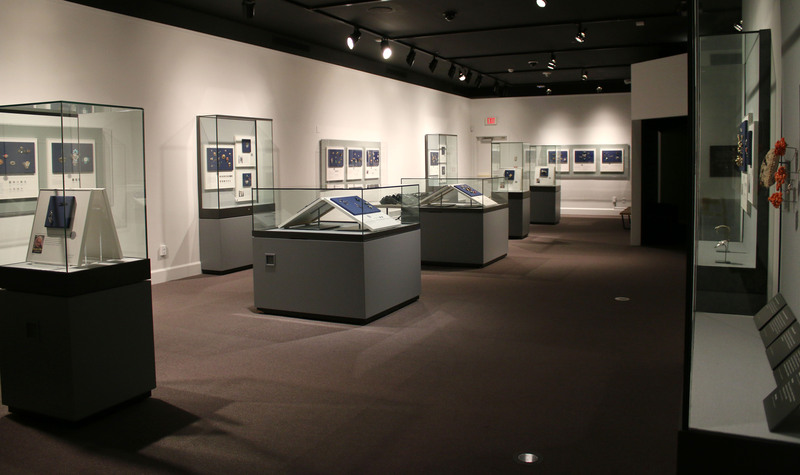 We are currently working with Audio Description Associates of Takoma Park, Maryland, on an Audio Description Tour of the new permanent exhibition for blind and vision-impaired visitors. The tour will be free to the public and available in both and English and Spanish language versions. Museum visitors will be able to download the audio tour to their own handheld devices or access it on one of the free hand-held media players that will be available for loan at the Henry A. Wallace Visitor and Education Center. 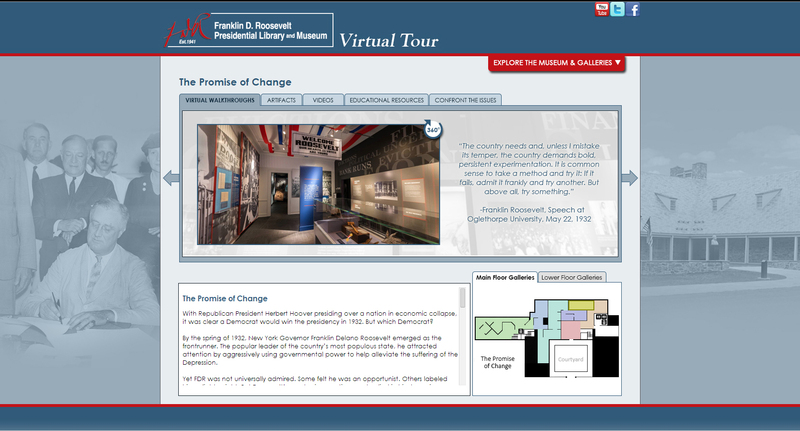 The tour will also be accessible to online visitors on the Library’s web site. 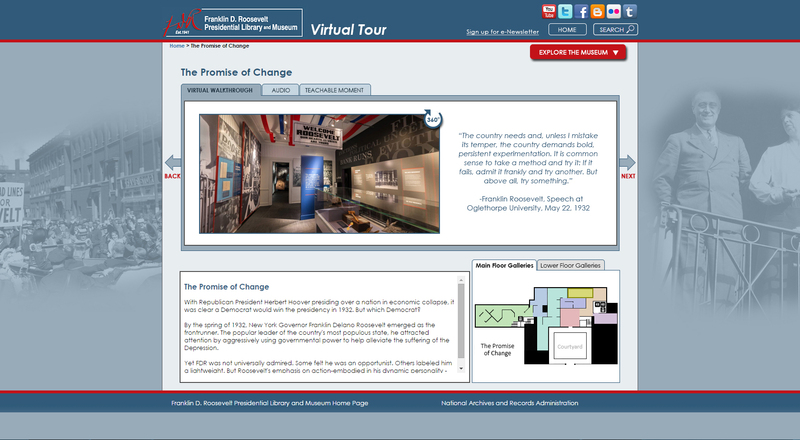 Another exciting new media program in development is an online, interactive Virtual Tour of the permanent exhibition. Funded by a grant from the Newman’s Own Foundation, this tour will allow users from all over the world to experience our Museum and access additional educational materials. This project supports the Foundation’s goal of providing access to resources that contribute to the development of a civil society. The virtual tour will employ high definition panoramic photography to give off-site users the experience of walking through the Museum. 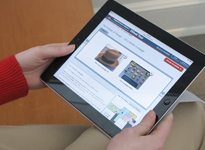 A zoom function will let users move around the galleries and select and learn more about specific artifacts, documents, photographs, and graphics. The Museum is working with the Dynology Corporation of Vienna, Virginia, on the development of the tour. Dynology is on the cutting edge of this new media tool. In recent years, a growing number of museums have begun to offer virtual tours. But most of these projects have involved art museums. History museums have been slower to embrace this new technology. Recently, Dynology broke new ground in the use of virtual tours in history museums with their innovative virtual tour of the United States Marine Corps Museum in Quantico, Virginia. Now they are working with us to expand on that model and create an even deeper and richer virtual experience. Katherine Sardino, our multi-talented Museum Technician, is leading the Museum’s team on both of these innovative projects, which blend technology with history to advance the Library’s goal of presenting “A New Deal for a New Generation.” Keep watching our website and social media for updates on the rollout of these projects later this year. 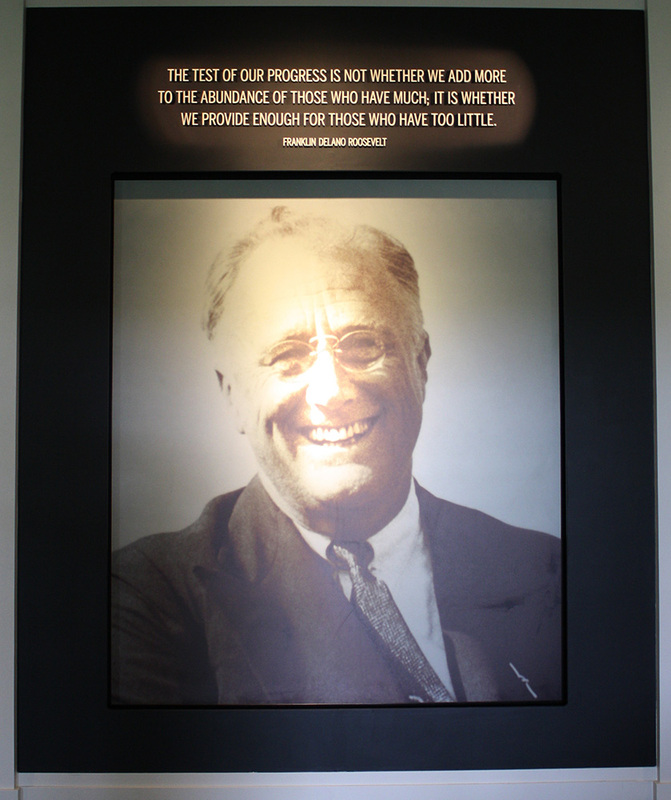 The learning begins as students enter the lobby of the Roosevelt Presidential Library and Museum welcomed by the friendly smile of our nation’s thirty-second president beaming down at them from a larger-than-life photograph. What lies beyond is a museum that brings to life the story of a twelve year presidency consisting of four national elections, the Great Depression, the Second World War; and the most remarkable First Lady of the 20th century. That’s a lot to cover in a single field trip. How can it possibly be done? That is a question that has both dogged, and delighted, me since becoming the Library’s education specialist nearly 13 years ago. The answer lies in breaking it all down and making sure that we address some fundamental elements that contribute to a meaningful educational experience. We begin with the intended audience in mind. Every decision that goes into planning and presenting our education programs is designed to meet the needs of the teachers and their students. Next we make sure that all of our programs are curriculum based, grade appropriate, and rich with primary source documentation. On the actual the day of the visit each group receives a program presented either by me, or one of my staff of four retired New York State Certified teachers. 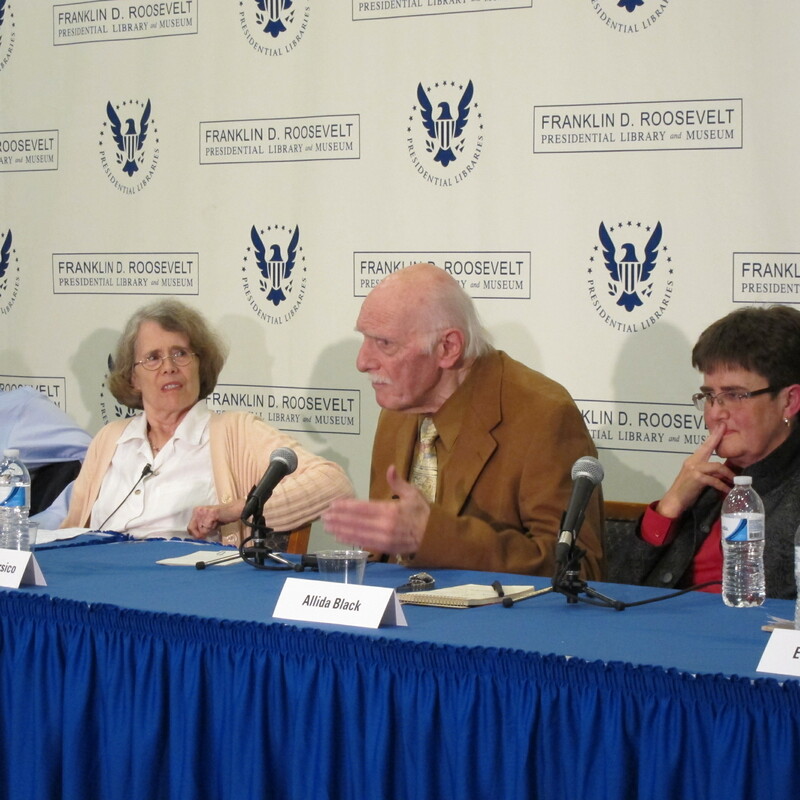 Three additional overarching principles run through each of the programs: the first is that given the limited time that the students are on site; there is no way that we can tell anything even approaching the entire Roosevelt story. We can only hope to ‘plant the seeds of wonder’ in the students – to spark in them an interest in the presidency, public service, and the chances and challenges that history has presented us with. The second principle is to highlight certain ‘points of departure’ for further examination of the issues and topics we introduce. A key element in teaching students how to be critical thinkers is to challenge them with questions, not simply supply them with answers. 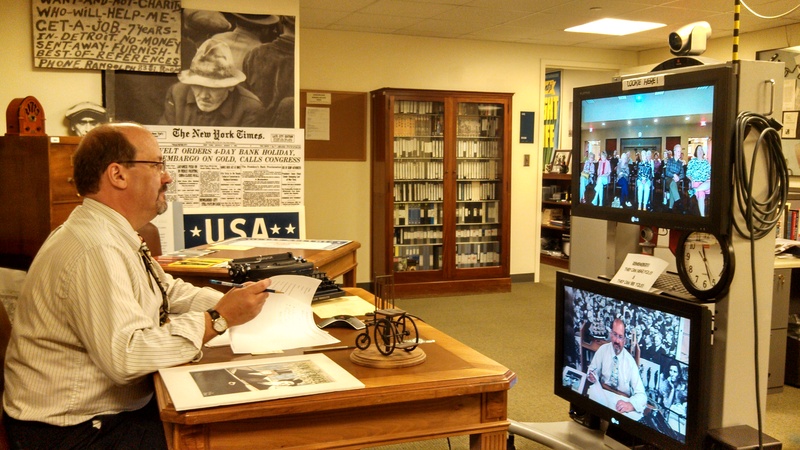 A fieldtrip to the Roosevelt Presidential Library and Museum provides a wonderful point of departure from which students and teachers are invited and encouraged to explore the past in greater depth and detail. This can be done either in the classroom or on their own. The final, and in many ways most important, principle is to make students aware that so much of what surrounds us in the world today can be traced back to the time of the Roosevelts. Some of these “current connections’-for example the Great Depression of the 1930s and the Great Recession of the last several years – are obvious. Others such as the push to expand electrification to rural areas then, and the push to expand WI-FI to some of these same areas today, are not. By applying the simple recipes as described above, seasoned with a dash of fun, the Roosevelt Presidential Library’s education department fulfills the educational needs of more than 16,000 students, and 1000 teachers who visit our site each year. Look for my next blog when I will talk about our distance learning opportunities and web materials for those of you too far away to visit in person.